Tropical tree growing approximately 25 feet tall, with pink, mauve or yellow flowers. Filipinos used the flowers to make a pomade or salve which they massaged on their bodies to ward off disease during the rainy season, and to counter insect and snake bites. In Indonesia the flowers were spread on the marriage bed of newlywed couples. Reminiscent of Jasmine, sometimes called "The Poor Man's Jasmine", Ylangylang's aroma sweet and exotically floral. Heavier than most florals. Most sources say yellow, however I have seen samples range from a deep golden, almost tea color to almost colorless. Guenther says that the "color of the oils ranges from light amber to yellow-brown. The "Extra" quality exhibits the deepest color." Methyl benzoate, methyl salicilate, methyl paracretol, benzyl acetate, eugenol, geraniol, linalol, linalyl bezoate, linalyl acetate and various terpines, among them pinene and cadinene. Reproductive System: YlangYlang mixed with jasmine or rose has been used to treat sexual difficulties, especially those stemming from lack of confidence and/or inhibition. It is useful in treating PMS and menopausal mood swings, especially when mixed with Clary..
Digestive System: Calminative. Useful for stress related digestive problems, especially. Skin: Anti-seborrheic, antiseptic. Promotes healing of wounds. In a facial oil or cream, it can help balance sebum production and is most helpful to oily skin. It also can fight the bacteria that often contribute to acne. It has traditionally been used in hair tonics and is believed to stimulate hair growth. Recent research indicates that inhaling ylangylang before the onset of a seizure may help control epilepsy. It is known in Asia as an antidepressant, relaxing to body, mind and spirit, as well as an aphrodisiac. It is said to calm anger, release tension, lift depression and generally stabilize mood swings. Julia Lawless recommends it for frustration borne of anger. 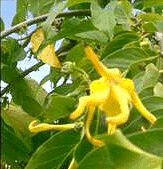 Ylang ylang is one of the few essential oils subjected to fractional distillation, i.e., yielding in succession YlangYlang Extra, (Ylangylang supreme) #1, #2, and #3 (normally; some distillers may produce more fractions.) A complete ylangylang is available either from a non fractional distillation, or from a combination of all the fractions. There are many different distillations of YlangYlang available on today's market. Each distiller judges his own different grades; there is no universal standard. Normally speaking, Ylangylang extra and 1st grade will contain more esters (primarily linalol) and thus be more effective as antidepressants relaxants. As you pass down to 2nd and 3rd grade, from the same distiller, you will see fewer esters, and an increase in sesquiterpenes. This might indicate that ylangylang 3 might be a better choice for skin care, for example. The higher occurrence of caryophyllene indicates that #3 might be useful in an anti viral blend, as well. Ylangylang Extra is most commonly used in perfumery, while ylangylang 2 or 3 are more apt to be used in soap and skin products. The scent becomes lighter and less heady as you go down the scale. Said to blend well with Bergamot, Grapefruit, Geranium, Jasmine, Lavender, Lemon, Neroli, orange, patchouli, rose, rosewood, sandalwood, tangerine and, for excitement, (according to Valerie Worwood) with black pepper. Ann Berwick suggests blending it with clove or sandalwood. Volatility in blending: base note. Excessive use can cause headaches; generally considered non-toxic and non-irritant. Not considered a known sensitizer. This article has been adopted to our new format from the original that still resides on naturesgift.com.